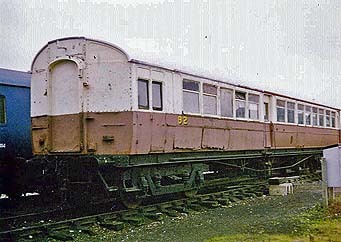 Trailer 92 was one of twelve trailers built as lot 1198 to Diagram U. The order was placed in March 1911 and all trailers were completed by September 1912. No. 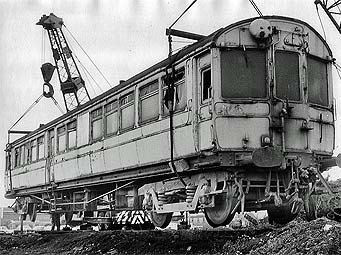 92 is recorded as being built in September 1912. These 70ft wooden-paneled trailers were built with a 61ft wheelbase and were carried on 9ft 'American' bogies. The accommodation comprised a driver's vestibule, a large saloon, an intermediate passenger vestibule with retractable steps, a small saloon, and a luggage compartment. The large saloon contained five pairs of walkover seats, with the end seats fixed, and two pairs of 9ft long longitudinal seats. The small saloon also contained five pairs of walkover seats, with the end seats fixed, but only one pair of longitudinal seats of 4ft 6in length was provided. The total seating capacity was 70 persons. The trailer worked primarily in the West Midlands, being allocated to Wolverhampton, Stourbridge, Stratford and Leamington. All the trailers were condemned in the mid to late 1950's with the exception of No. 91 which survived until after 1961. No. 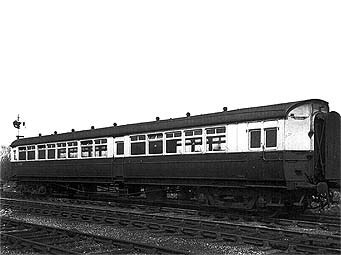 92 was withdrawn in January 1957 and used initially as a mess room by GKN workmen in Cardiff Docks. It was acquired by the Great Western Society in 1969 and was originally stored at Swindon. It was moved to the Society's Taunton depot in 1972, and finally to Didcot in 1977. Once at Didcot it had some cosmetic and preservative maintenance work carried out on it and was used as staff accommodation. In September 2007 the vehicle was transported, together with Railmotor 93, to the Llangollen Railway where it is currently being restored in the C&W workshops.